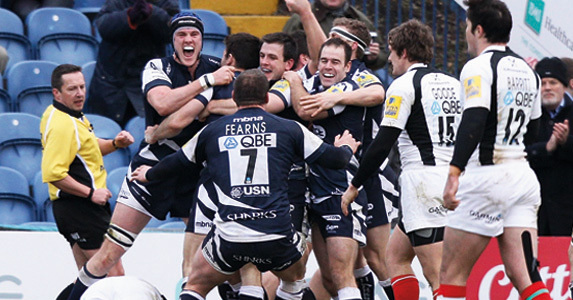 EXETER may be kicking up a stink about visiting Edgeley Park on Good Friday but the Premiership newboys’ snooty putdown of the facilities at Sale’s HQ has only served to make the Sharks more determined to win Friday afternoons game! One Sale official was moved to reveal the Sharks had already ordered in extra supplies of Harpic and Blue Flush so as not to offend the Chiefs! But for Sharks executive director of sport Steve Diamond, Rowe’s outburst has only served to strengthen his hand in terms of pre-match preparations for what will be the Sharks’ final Aviva Premiership home game of the season. “To be honest I’ve never heard of Tony Rowe but his comments have just helped me with my team’s motivation for the game,” was Diamond’s withering assessment of Rowe’s verbal stink bomb. “He can’t flatter himself and think that Exeter are that powerful that they can come up with those expectations. “The Exeter coach Rob Baxter has done a brilliant job at Exeter but he has been let down by his Chief Executive who has said the wrong things at the wrong time, having had less than one year’s experience of the Premiership having spent the previous 15 years trying to get here.